We all dream of going to festivals like Coachella, Tomorrowland and Glastonbury, but if they sell out before we can get tickets then what do we do? We can go to a run of the mill music festival and think about what could have been, or we can attend a completely out of the ordinary event and have unique memories that’ll last a lifetime. There are weird events all over the world, and while it might not quite live up to seeing your favourite band live, if you go to one of these festivals you’ll certainly have a story or two to tell. Every summer, a city around 200km south of Seoul on the coast of South Korea hosts a festival where you don’t just get your hands dirty. 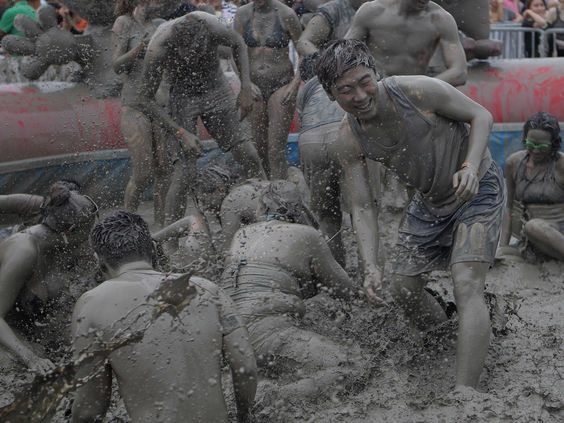 Festival goers are treated to mud mayhem, which may seem like just a bit of fun for big kids, but which actually started as a promotional tool for the mud’s invigorating benefits for the skin. The 2018 dates are unconfirmed, but the festival is usually held on the second weekend of July. As weird as covering yourself in mud all day is, watching someone play a non-existent guitar might just take the biscuit. In fairness of the event, it is used every year to promote a different cause, with this year’s being used to tackle climate change. 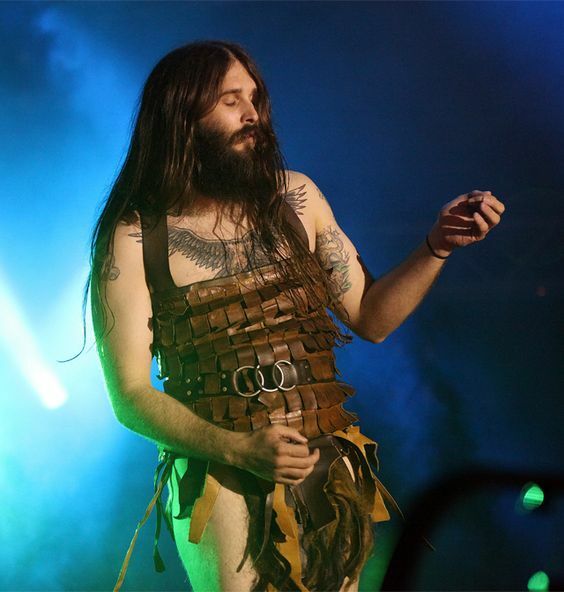 We’re not sure how air guitars will do this, but they certainly aren’t bad for the environment. The event this year is being held between the 23rd and 25th of August. Known simply as ‘that festival where they throw tomatoes’ to most people, La Tomatina is one of Spain’s most famous festivals. 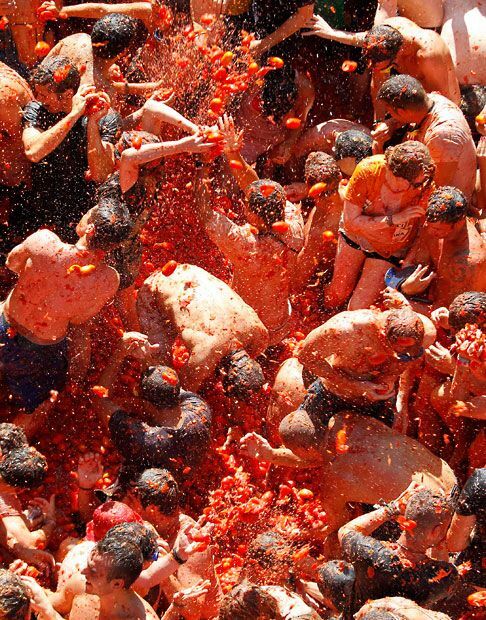 Held in Buñol, it’s essentially the world’s biggest food fight, with the premise being to hit as many people as possible with tomatoes and to avoid being hit by them yourself. FYI, it’s not free entry. How else do you think they pay for all the tomatoes? The event is held on the last Wednesday of August, with this year being the 30th. This festival is more widespread than the others on this list, but it’s weird all the same. December 6th is when many Europeans celebrate Christmas, so on the night of December 5th, a dark Christmas tradition takes place. 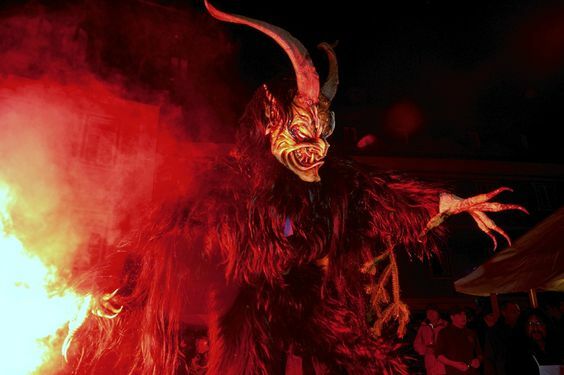 Krampus is a sort of anti-Santa, who punishes children who have been misbehaving by giving them charcoal instead of presents. December 5th is when the tradition is celebrated, and you can attend in many parts of Germany and Austria.